Quite frankly, I squealed with joy when I found out who this week’s Vendor of the Week was going to be. 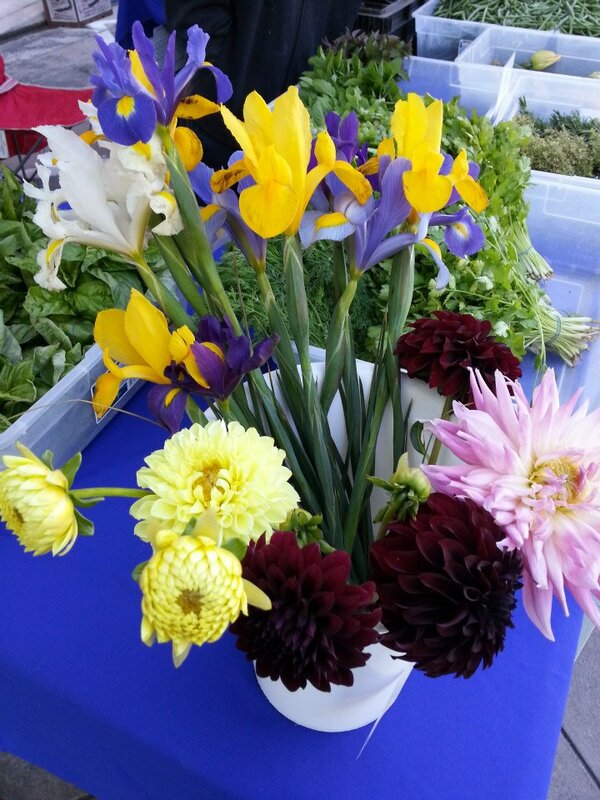 GT Florists and Herbs is fun because the big, colorful blooms are a perfect way to cheer up your desk or kitchen table. More exciting to me though was the opportunity to really play in the kitchen. Their variety is great and everything looks and smells so good. GT Florists & Herbs is a locally owned, family operated, retail and wholesale flowers and herbs business located in Fresno, CA. Their prices are incredible- usually when I want dill at Whole Foods I guiltily look at my son and tell him we’re dipping into his college fund to pay for soup seasonings, however with GT Florists and Herbs I was able to get my dill, beets and Kale all for under $5. Actually, it might have been $3 total. I was so in shock that I didn’t take note of the price. But man, it was low. Kale addicts out there are probably totally feeling me on this too. 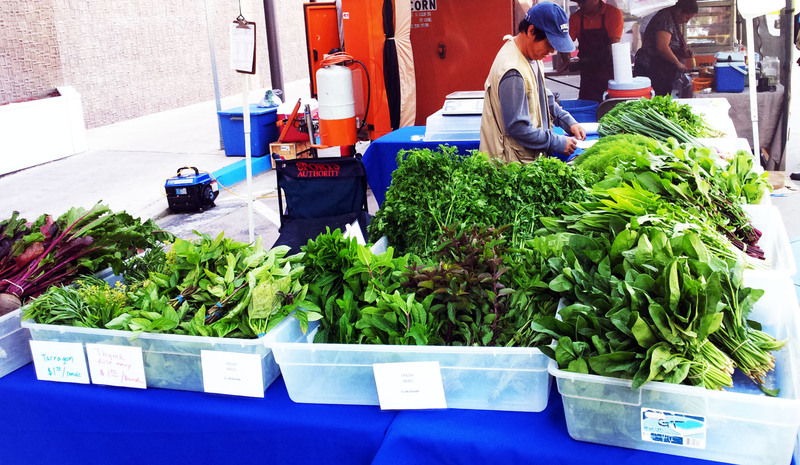 This is your ticket to dirt cheap green juice! And look at that photo, oh those colors! Brides could have carried my market bag contents as a bouquet, it was so pretty. Plus it smelled amazing. Dill is one of those herbs I’ve really grown to appreciate in the last few years. If your only brush with “dill” is in pickle form you’re seriously missing out. It’s fresh, tangy and dill-ightful. It reminds me of my Russian exchange students. It makes me want to have a picnic. In short, I love it. 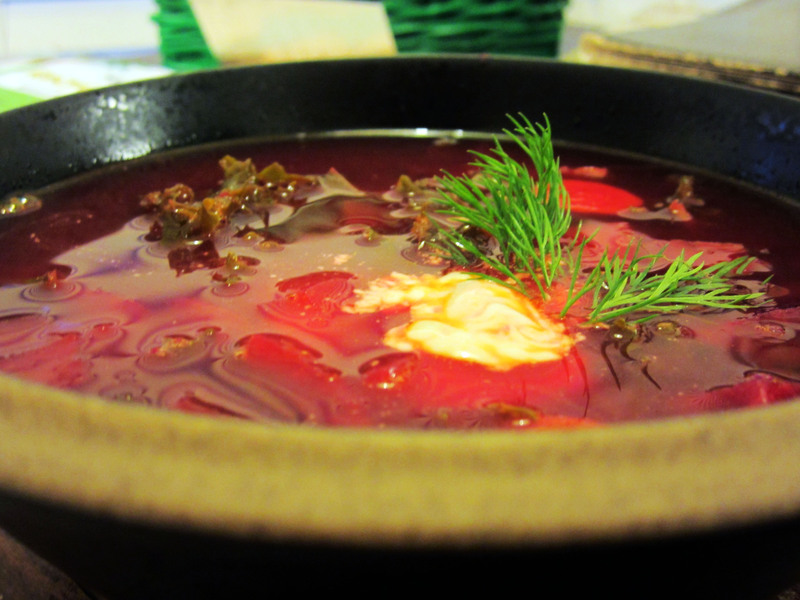 This week I made a Russian classic- just call me the Tolstoy of the kitchen, with the War and Peace of soups: Borscht. Borscht is not for those short on time, but if you make a huge pot you’ll have plenty to freeze for quick and easy meals later on. In short, put “Borscht” on your schedule some Sunday and give this hearty and super tasty soup a try. Plus, it’s pink. You can’t go wrong with magenta at the dinner table. This is my go-to soup. I’m giving my approximate directions, I don’t really believe in exact measurements when it comes to cooking. I think that when you create in the kitchen it should be with your senses, not a piece of paper. I totally get that some folks need the road map, though. So if you want absolute precision- check out this Borscht recipe. This is where I first learned to make it a few years back. But I’m telling you- trust me on this one. Follow your instincts when it comes to soup making! In addition to my GT Florists and Herbs haul of kale, beets and dill I needed a few other things. Here’s what you’ll need. 1 Carrot, chopped or shredded. I like chopped. Any other veggies you have that need to be used. I had yellow squash that was destined for the compost pile if I didn’t do something fast. 1 can of white beans, rinsed to get rid of the extra sodium. You’ll make up for the saltiness in the bouillon! Better than Bouillon vegetable base. Based on your pot-size follow the instructions on how much to use per cup. A bunch of kale. Traditionally you’d use cabbage but I’m a kale junkie. About 1/2 cup of chopped fresh dill. Adjust this to your taste preferences! 1/4 cup ketchup. Try to find one without high fructose corn syrup in it. That stuff freaks me out. Get your biggest soup pot out, fill it 3/4 up with water and throw it on the stove. Turn it on, this could take a while to heat up. While the water is heating up, cut the greens and the tail off of the beets, scrub them up and then put them in the probably tepid-by-now water. Boil and cook for 30-40 minutes. You want to be able to easily push a butter knife through the beets. While this is taking forever to happen, use your time wisely and scrub and cut your potatoes. I like the skins on mine, but if you don’t like extra fiber, vitamin c, vitamin b and iron that’s your deal. I cut them into eighths, you can do them bigger or smaller. Put them into a bowl so your cutting surface is ready for more action. Dice the onions and carrots and throw them into a skillet with a splash of olive oil. If you’re cutting back on unnecessary fats, you can actually omit the oil and use broth or water. Onions are great in that they emit their own juices and you don’t even need oil or anything. Once the onions are looking golden/see-through add the ketchup and stir-fry it in for a few minutes. This gives your soup a great, full flavor. 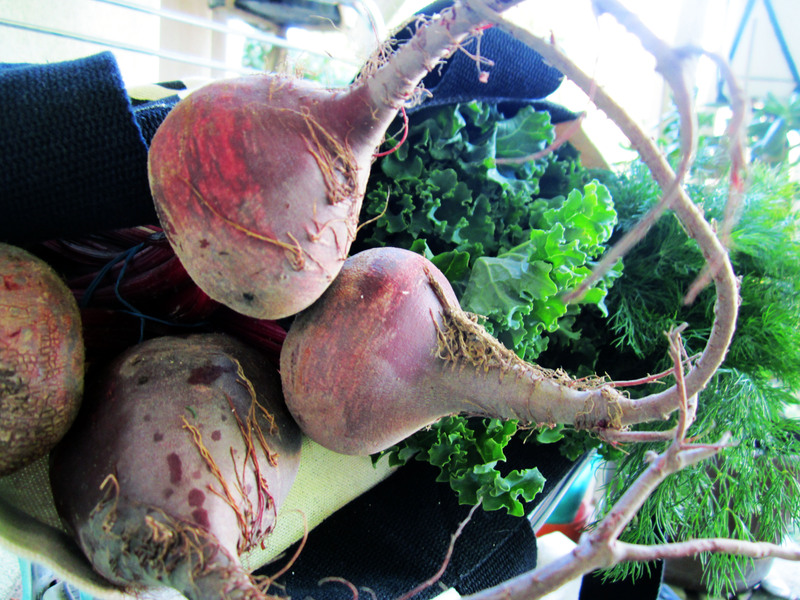 Check those beets. Are they soft? If so use a spoon or ladle to fish them out. DO NOT DUMP THE WATER- this is your soup base! Let them cool in a colander and put the chopped potatoes in the beet water. 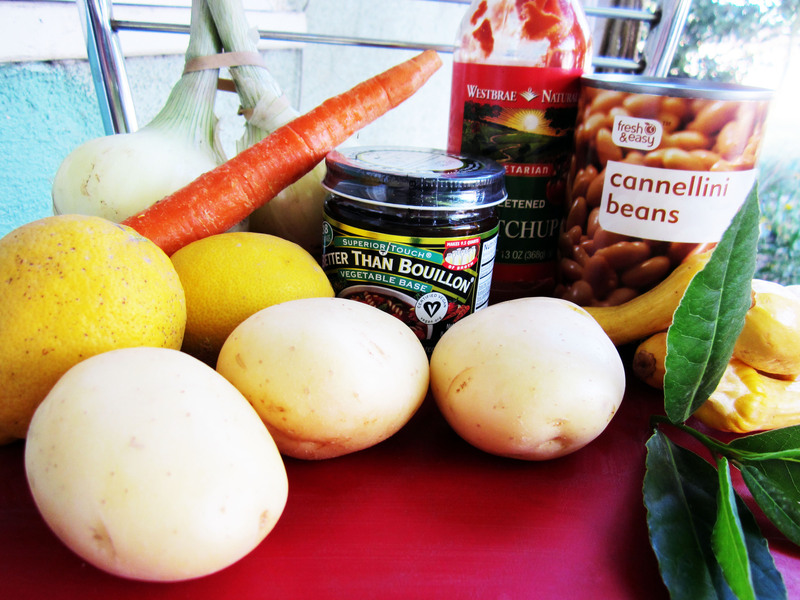 Add bouillon. Add beans. Add onion-carrot mixture. Throw in the bay leaves, the pepper- it’s a party! 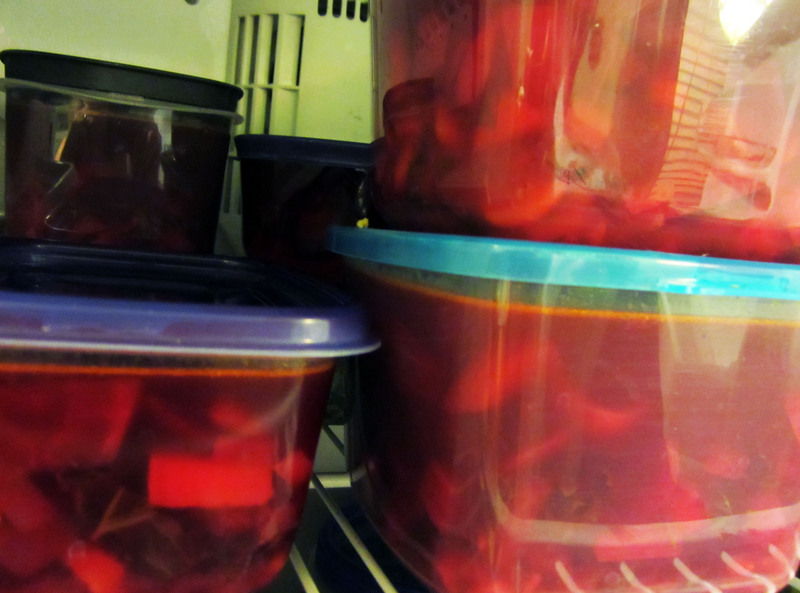 Slip the cooled beets out of their skins. This sounds creepy and it totally feels that way, too. Your hands will be stained for a little while, FYI. Wear gloves if you don’t have a sense of humor. I use a spoon to help slide the skins off. Chop them up. I like chunkier beets, but lots of people do the labor intensive matchstick thing. Put them in the soup pot. Let everything simmer. Juice the lemons. Put the juice in the soup pot. Keep on simmering. Chop the kale into bite sized kale-ettes. Keep in mind it will lose a lot of it’s size once thrown into the pot. You can do 3 cups of chopped kale or more and it won’t be over-kale. (That was an overkill joke. It went about as limp as that kale you’ll be cooking.) Throw it in. And now for the pièce de résistance, the dill. Take your fresh dill and chop it up. I use a lot. Go by taste. Go ahead. Throw it in. Let it simmer for a few more minutes and then remove from heat. Oooh and aaaah at the smell, the colors… the taste! Baby, your borscht is done! To serve your borscht in the traditional way, add a dollop of mayo or sour cream. I used Vegenaise, or you can use nothing at all and delight in it, in all of it’s soupy glory. Once you’ve reached your bliss point, take the extra soup and freeze it for later. Borscht to go! It beats (beets?) fast food any day and you’ll genuinely be excited about brown bagging your lunch for once. Having pink soup is a great conversation piece too. I hope you enjoy borscht as much as I do. Aside from being a fun word to say, it really is a complete meal. You can bulk it up with more protein by adding in quinoa or another can of beans if you’re worried about that sort of thing. Sometimes I get crazy and toss in whole wheat bowties and rotini to make it a fun noodle soup. It’s a great base to play with. Let me know how you prepared yours! Have a healthy, happy downtown day!